Today, 3.14, March fourteenth, is Pi Day. Pi Day is to honor the beloved constant or 3.1415926535… or the ratio between the diameter and circumference of a circle. What better way to celebrate Pi than with pie? 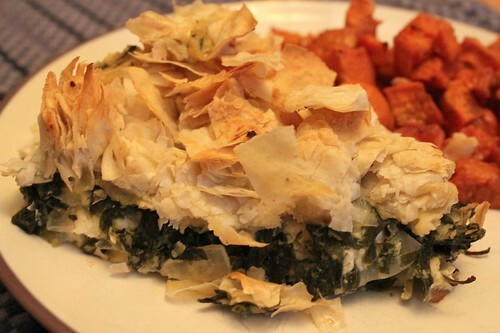 One of my favorite vegetarian savory pie recipes, Spinach Feta Pie, is below. Share your favorite with the Mr. Linky or in a comment! 1.Heat oven to 350 deg F.
2. Sweat onions and garlic in 2 tbsp olive oil until translucent. 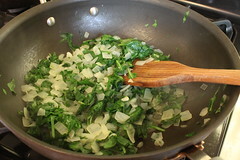 Add spinach until wilted. Allow to cool. 3. 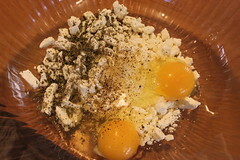 Stir together feta cheese, eggs, bread crumbs, and spices. 4. 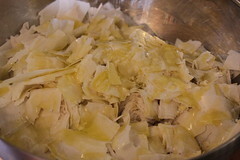 In a separate bowl, stir phyllo and 2 tbsp olive oil together. 5. Optionally, line the bottom of a 9 inch springform pan with parchment for easy cleanup and no spills in the oven. An easy way to do this is fold a piece of parchment into a square, then fold into a triangle twice holding the center of the paper as an endpoint. Match endpoint to the middle of the spring form, cut a semi circle shape where the endpoint meets pan side, and open to reveal a circle like form. You just approximated a radius (half a diameter)! Multiply the diameter times Pi and you have circumference! 6. 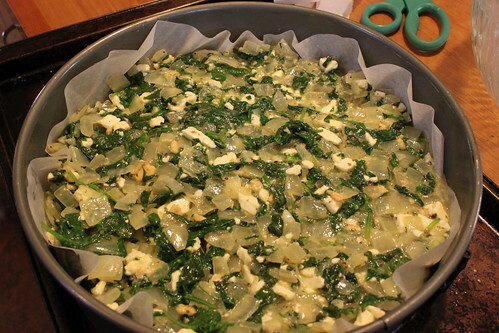 Combine cooled onions, garlic and spinach with the feta mixture. Press into prepared 9 inch springform pan. Place pan on a cookie sheet. 7. 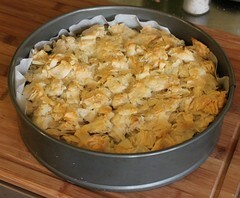 Top pie with the phyllo dough pieces. Drizzle a little more olive oil on top for extra crisp deliciousness. 8. Bake for 30 minutes or until top is golden brown. Note: This pie is a great recipe to make double and freeze. The frozen pie will take 1 hour 15 minutes to bake. I hope you enjoy some Pi Day pie today. Please share a pie recipe, memory about pie, or pie making tip in the comments! If you participate in the blog round up, please let your readers know and link back to this page.